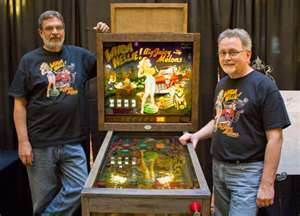 MELROSE PARK, Ill., March 19, 2015 /PRNewswire/ -- Today, Stern Pinball, Inc., the world's oldest and largest producer of arcade-quality pinball games, and Whizbang Pinball LLC officially announced the availability of their Whoa Nellie! Big Juicy Melons™ pinball machine. Whoa Nellie! Big Juicy Melons™ pinball takes players on a journey through the Mellon Family farm renowned for abundant produce. Players score points on the farm operated by the lovely Melony Mellon and her twin sisters while avoiding the wrath of their over-protective shotgun-wielding father. The colorful easy-to-learn game features a fun classically styled pinball playfield tuned for a balance of randomness and skilled shooting challenges. The game rewards players of all skill levels. "Whoa Nellie! 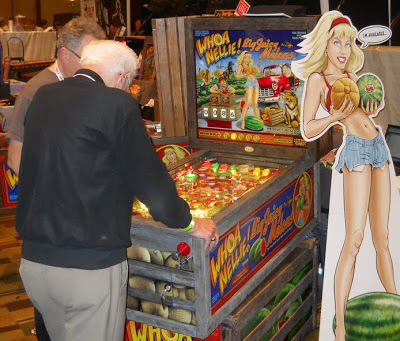 Big Juicy Melons™ offers an entertaining classic pinball experience," said Gary Stern, Chairman and CEO of Stern Pinball. 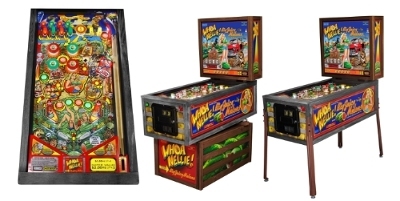 "We're excited to work with Whizbang Pinball to provide players and operators with a unique pinball game and a fun playing experience." Whoa Nellie! Big Juicy Melons™ is available through authorized Stern Pinball distributors and dealers around the world. Whoa Nellie! Big Juicy Melons™ merchandise and accessories are now available through the Stern Shop: http://costore.com/sternpinball/welcome.asp and select authorized distributors and dealers around the world.